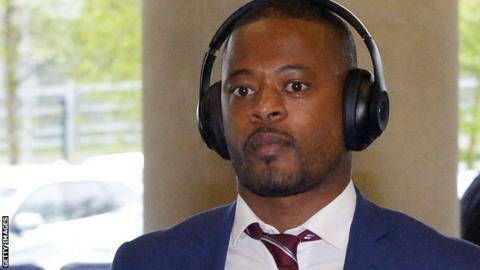 Ex-Manchester United defender Patrice Evra said "I love everybody" after Paris St-Germain accused him of making "homophobic insults" against them. Evra used a French word that is derogatory to homosexuals in a video on social media in which he taunted PSG over their Champions League defeat by his former club. "I am not homophobic," said Evra, 37. "If I offend someone or I hurt someone I really apologise, but you know it's not my intention." In his social media post on Tuesday, the former France left-back says he made the video "as a joke", adding the French media had taken his use of the derogatory term to mean he is "against gay people". United won 3-1 at the French champions to overturn a 2-0 deficit from the first leg and go through to the quarter-finals of the Champions League on away goals. In his earlier video, Evra also appeared to threaten ex-PSG winger Jerome Rothen - a former team-mate at Monaco and France - over a separate clip in which he celebrated United's victory from the stands at the Parc des Princes. The statement issued by PSG said: "We strongly condemn Patrice Evra's homophobic insults aimed at us, our representatives and former players on social media."